It’s a happy day when astronomers figure out what’s up with an enormous space blob—and the answer doesn’t imply the immediate destruction of humanity. You probably haven’t heard of SSA22-Lyman-alpha blob 1, but rest assured, telescope jockeys have been scratching their heads over it for years. Now, a team of astronomers has finally figured out what’s happening inside the blob that’s causing it to light up. Lyman-alpha blobs, or LABs, are clouds of cold hydrogen gas spanning hundreds of thousands of light years in the most distant reaches of the known universe. They get their name from Lyman-alpha radiation, a distinct wavelength of UV light that’s emitted when electrons in hydrogen atoms jump from one energy state to another. Because LABs are found billions of light years away, their radiation signature is redshifted all the way down to the optical by the time it reaches our telescopes. To us, the blobs look like weird smudges of color suspended on the edge of time. SSA22-Lyman-alpha blob 1 (LAB-1) was the first such blob astronomers discovered, all the way back in 2000. To date, it remains on of the largest LABs ever spotted, but like most of its brethren, the blob’s tremendous distance—11.5 billion light years from Earth—has made it difficult to study. Nevertheless, there’s reason to think this blob is special. To test that hypothesis, Geach and has collaborators turned to the Atacama Large Millimeter Array (ALMA), a radio telescope with unparalleled ability to resolve sub millimeter emissions, a form of long wavelength radiation used to study cool gases in faraway corners of space. Previously, other telescopes had detected sub millimeter emissions coming from the center of LAB-1, but with ALMA’s greater seeing power, Geach was finally able to resolve the source. It turned out to be two. 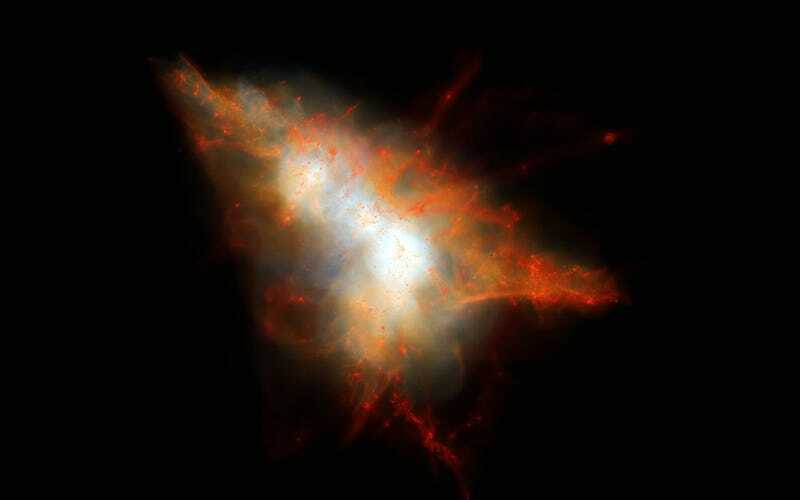 “We found that this single [emission] breaks up into several clumps, corresponding to different galaxies,” Geach said. In fact, the emission comes from to two large, central galaxies on the verge of smashing together. And there’s something else. Like hungry piranhas waiting to feast on the carnage, a swarm of smaller galaxies appear to be chilling around the perimeter. “We’re basically seeing the formation of the center of a cluster of galaxies, right when all the action is taking place,” Geach said. But wait, didn’t this intergalactic mosh pit look like nothing more than slimy green jello for nearly twenty years? Geach thinks he knows why. Using a sophisticated computer model, he was able to reproduce the blob’s Lyman-alpha signature, if UV light produced during star formation was scattered off cold hydrogen gas in its surroundings. Geach’s discovery, which has been accepted for publication in the Astrophysical Journal, has some major implications for astrophysics. If other LABs turn out to be powered by galactic cluster formation, too, then these blobs could offer an unprecedented window into the assembly of enormous structures in the early universe. They may also be one of our best opportunities to shed some much-needed light on dark matter. The next step will be to observe other LABs with ALMA, and determine whether similar processes are playing out at the center. Still, just knowing that LAB-1 can be explained by perfectly natural astrophysical processes is great news for Earthlings. If all that light was coming from an 11 billion year-old civilization with a trillion fusion-powered warships, I’m not sure we’d be safe in this universe.